Blue light exposure, whether outdoors from the sunlight or indoors from LED backlit screens, can have deleterious effects. Based on a literature review, Victor Molina describes numerous ocular complications that blue-violet light exposure can induce. He also elaborates on preventive measures, specifically blue light filters, that eye care professionals have at their disposal, and describes who may benefit the most from these solutions. The digital revolution and the widespread use of smart mobile devices (telephones, tablets, e-readers, video display terminals [VDTs], etc.) provide on the one hand innumerable benefits, but have led to the rise of a variety of novel visual problems. One such problem is exposure to blue light. Blue light is mostly emitted outdoors by the sun, but is also found indoors in “cold-white” light emitting diodes (LEDs) present in the lighting systems of most backlit screens, televisions, etc. in an increasing number of homes, workplaces and shops. LED lighting has replaced the traditional bulbs and fluorescent tubes as the most efficient form of lighting in terms of energy. Blue light is the part of the visible spectrum closest to ultraviolet radiations, and is composed of short wavelengths ranging from 380 to 495 nm corresponding to the highest energy of visible light. It has been linked to various ocular problems that can be classified into five major groups: visual fatigue, dry eye, discomfort from glare (these three elements being closely linked), retinal cell damage, and alteration of physiological cycles (sleep, tiredness, depression, irritability). Scientific evidence for the link between blue light and these problems is reviewed here. The sensation of dry eye and its many associated symptoms is closely linked to CVS. [8,9] Dry eye in VDT users has been associated with reduced tear film break-up time. Regardless of whether it is productive or evaporative dry eye, the symptoms worsen when carrying out close-up activities with any type of digital screens equipped with blue light-emitting LED lighting. [11,12,13,14,15] A close link has been demonstrated between tear film stability and visual function under blue light exposure. Patients with dry eye experience fluctuations in visual acuity, which worsen when performing continuous close-up activities, particularly with screen use. Consequently, limiting exposure to short-wave blue light (in time and intensity or by filtering) would help reduce visual difficulties for patients suffering from dry eye with low break-up time. We also need to take into account the fact that complaints by these patients of a sensation of glare or halos increase when working with sources of backlighting which emit blue light, a far stronger source of light scattering than longer wavelengths. Glare may be defined as the loss of contrast in the retinal image resulting from or triggered by light scatter or stray light, due to entopic phenomena -intraocular light dispersion [ILD]- or by the presence of an object in the visual field or between the light source and the eye or in the presence of a source of intense light. 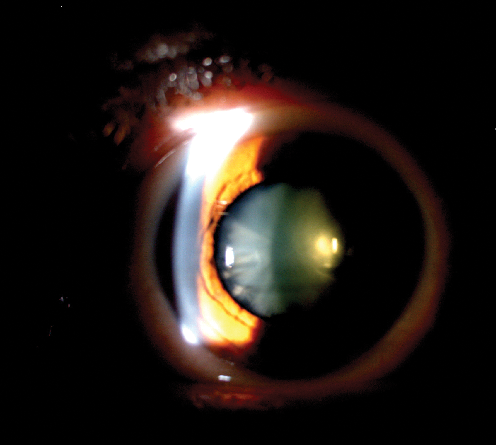 [19,20] There are several types of glare; disability glare such as oncoming car headlights when driving at night, adaptation glare with traumatic mydriasis, dysphotopsia referring to halos observed after photorefractive or cataract surgery (or a similar phenomenon due to lack of media transparency or instability of the tear film), and discomfort glare e.g. induced by a window in an improperly fitted office or reflections on a tablet screen. [19, 21] Irrespective of the type of glare and its origin (external or entopic), blue light - and thus LED lighting - is a cumulative factor. LED lights are found in both backlit screens as well as environmental lighting (offices, shops, televisions…). They provide more luminosity more efficiently than other types of lamps, and a large proportion of their spectrum is short wavelength, increasing the visual field and peripheral vision (explaining their widespread use in the car industry). However they result in a greater sensation of discomfort from glare than other types of lamps, with increasing discomfort associated with increasing blue light in the light source. 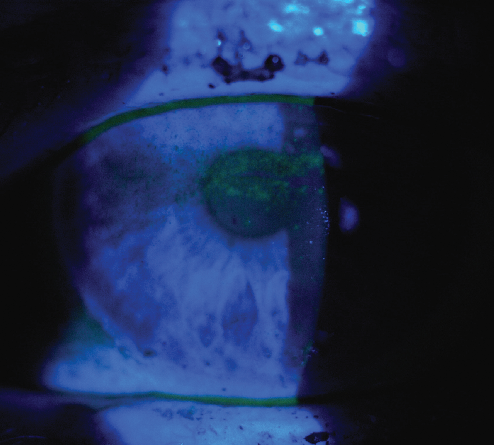 And related to entopic phenomena, blue light is directly associated with increased intraocular light diffusion, which assumes increased significance when there is a lack of media transparency, such as with keratitis resulting from dry eye (Fig. 1) or in the case of age-related cataracts, which, as they progress, increase the patient’s sensitivity to light intensity and glare. (Fig. 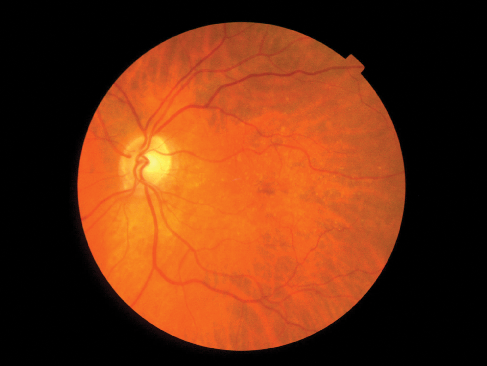 2) This is also true in cases of macular dysfunction where the retinal image is formed with difficulty (age-related macular degeneration [AMD], central serous chorioretinopathy, etc.). These in vitro processes have been linked to blue LED light exposure which, compared to green and white LED light, increases ROS production and causes photoreceptor-derived cell damage. Nonetheless, the wavelenght-dependent effect and its influences on white LED light-induced retinal degenerations is not yet fully understood. The role played by exposure to the visible light spectrum in potentially damaging the retina and its pigment epithelium, and of photochemical damage involved in the development of AMD was established in the late sixties. Several studies have demonstrated the mechanisms leading to increased ROS production. The cumulative absorption of blue-violet radiations of the electromagnetic spectrum by visual pigments (melanin, melanopsin, flavoproteins or lipofuscin) increases ROS production which is in turn linked to the development of AMD. [36, 37] Nonetheless, the role of blue-violet light in the pathogenesis of AMD remains controversial mostly because of the limitations of the past in vitro studies. As daytime animals, human physiology is in part regulated by light. Blue-turquoise light ranging between 465 and 495 nm, plays a critical role in linking our internal biological cycles, the circadian rhythms, to the external environmental conditions. Dysfunctioning of these cycles is linked to a wide range of psychological disturbances and systemic diseases: sleep disorders, depression, anxiety, obesity, diabetes, heart disease and stroke, cancer, etc. [38, 39, 40, 41, 42, 43] Among the various mechanisms that have been described to explain this connection, light, in particular blue-turquoise light, is the principal agent regulating our biological cycles and rhythms. The gradual opacification of the crystalline lens due to ultraviolet over-exposure, leading to the development of cataracts causes a reduction in light transmission, especially short wavelengths. [44, 45] After a cataract operation, not only are visual capacities recovered, but quality of life improves with less depression, recovery of sleep routine, etc. The use of antioxidants such as N-acetylcysteine or NAC to avoid the production of ROS induced by blue-violet light, is a potential tool to address some of these retinal complications. Without a doubt however, the use of selective filters to filter blue-violet wavelengths has proven to be the most complete solution to date. A similar situation may apply to blue light filters designed by the optical industry for this purpose, although irrespective of the data and proofs obtained in the laboratory the fact that the subjective sensation of visual benefit may vary significantly between individuals under real-life conditions should be taken into consideration, especially when evaluating subjects with visual pathologies. Visual acuity tests are inadequate to actually assess visual behavior and degree of comfort of our patients in real-life situations. Colour and good contrast sensitivity, both black/white and polychromic, are a fundamental aspect of the evaluation given the increasing time spent looking at documents, web pages, video games, etc. Thus filters that increase contrast are an important tool for eye care professionals. They are particularly of value in the presence of glare and/or lack of media transparency which reduce image quality for patients suffering from cataracts, chronic keratitis and dry eye, pupillary defects, post-surgery refraction, etc. 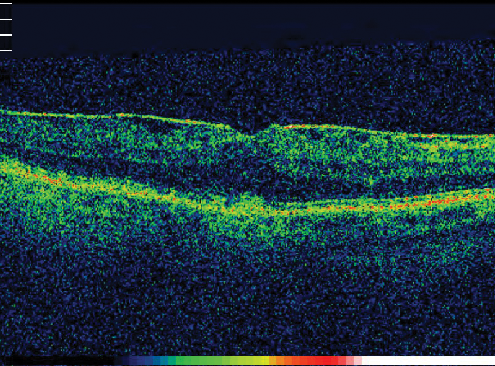 In such cases, measurement of contrast sensitivity function is essential to ensure optimisation with ophthalmic filters. 7. Who benefits from blue light filters? The most obvious answer would be to cite the entire list of ocular conditions previously mentioned. These are all conditions in which glare and loss of contrast sensitivity function and the disorders induced by them play an important role in visual discomfort[70, 71]. Similarly, patients with AMD are at higher risk, since blue-violet light exposure may contribute to their disease as is anyone exposed to sources of blue light or an environment dominated by cold-white LEDs. At this point we can ask, who is not exposed to these conditions? 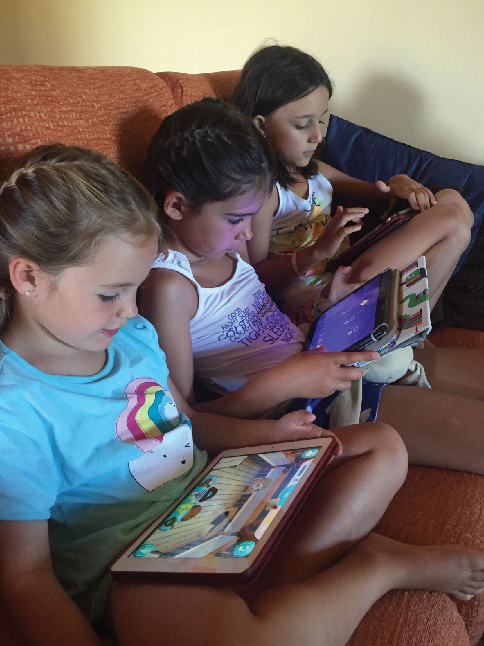 From the digital dad who shops on the internet, to the digital mom who surfs web pages, the grandmother who talks on Skype, the international businessman who conducts business on a tablet, the child who chats via smartphone, the teenager who spends hours on a video console. All of us, whatever our age, are liable to experience some of the visual complications associated with increasing exposure to blue light. However, in a recent survey of Spanish visual health professionals, only 40% cited the 0 to 15-year-old age group as a range for whom lenses filtering blue-violet light should be prescribed and, likewise for patients aged 65 and up, only 30% of the respondents considered the prescription of such lensesnecessary. This is ironic given that 65 and up it is an age range most likely to experience pathological retinal changes, where media transparency makes the use of filters that provide adequate contrast sensitivity function and protection against glare even more important; and children are one of age groups more exposed to the widespread use of digital led-light devices (Fig. 5 ). Moreover and surprisingly, only 54% of respondents believed that any user will benefit from using a blue light filter, while the remaining 46% considering them only necessary for patients requiring them for professional activities (truck drivers, computer technicians, office jobs, etc. ), or for ocular diseases. • Investigations into cumulative exposure to blue-violet light support a link with various visual conditions and pathologies. • The literature implicates blue light exposure in numerous visual symptoms ranging from visual discomfort induced by glare to alterations of physiologic pathways resulting in retinal cell death. • Reducing ocular exposure and absorption of blue-violet light improves critical visual functions such as contrast sensitivity and limits alterations like visual fatigue, glare or dry eye. • Lenses filtering blue-violet light designed by the optical industry are useful to reduce blue light exposure and help eye care professionals to address a range of problems associated with retinal damage and offer a simple, effective solution to their patients. 01- The Effect of Blue Light on Visual Fatigue when Redding on Led-Backlit Tablets LCDs. Haruo Isono, Apurva Kumar, Takuya Kamimura, Yuuta Noguchi, Hiroyuki Yaguchi. Tokyo Denki University. VHFp2-9L. 2013. 02- Reading on Lcds vs e-ink displays: effects on fatigue and visual strain. E.Siegenthaler, Y. Bochud, P. Bergamin, P. Wurtz. Ophthalmic and Physiological Optics 32, pp 367-374. 2012. 06-Bergquist U, Knave BG: Eye discomfort and work with visual display terminals. Scand J. Work Environment Health.1994 (1)27-33. 07-“ the complex of eye and vision problems related to near work which are experienced during or related to computer use”. American Optometry Association. 09- Thorud HM, Helland M, Aaras A, Kvikstad TM, Lindberg LG, Horgen G. Eye-related pain induced y visually demanding computer work. Optom Vis Sci. 2012; 89:E452-464. Doi:10,1097/OPX.0b013e31824c1801 PMID:22366711.